The Halo 3: Original Soundtrack is the musical score to Halo 3. The track was composed by Martin O'Donnell and Michael Salvatori, produced by Nile Rodgers, and is a two-disc set much like the Halo 2: Original Soundtrack. 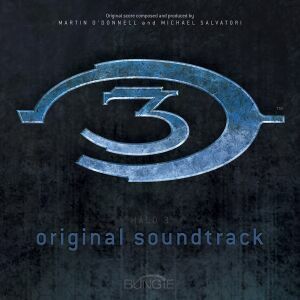 The Halo 3: Original Soundtrack was released in one set rather than separate volumes like its predecessor. The Halo 3 OST deviated from the Halo 2: Original Soundtrack, and reverted back to the structure used in the Halo: Original Soundtrack. Comprised of melodies, chants, and trumpets, the Halo 3: Original Soundtrack is broken up into chapters which correspond to in-game levels. Disc one is broken up into into the beginning levels of the game, and splits at about midway though the campaign. Consisting of 15 songs of longer length, disc one runs slightly longer than disc two. Consequently, disc two is broken up into the latter levels of the game, while including four bonus tracks. One of these bonus tracks is the music present in the E3 2006 Trailer with the exception of the dialog. Composed of music entirely in-game, from start to finish, the story of Halo 3 is played out in musical form. Quite a few songs on the soundtrack are re-mixed and re-mastered versions of songs that appeared in Halo: Combat Evolved and Halo 2. "On a Pale Horse" redone as "Behold a Pale Horse". "Brothers in Arms" redone as Follow Our Brothers, Last Of The Brave, and This is Our Land. The first part of Enough Dead Heroes is redone in Honorable Intentions. The climax of Enough Dead Heroes (heard when fighting Hunters in the first game) is redone as Brutes. The last third of Enough Dead Heroes is redone as No More Dead Heroes. Perchance to Dream and Under Cover of Night are mixed together in "Dream Again", part of Brutes. The Enough Dead Heroes melody is also remixed in the second part of This is Our Land, the middle of Three Gates, etc. A Walk in the Woods redone as "Another Walk". The beginning of "Truth and Reconciliation Suite" redone as "Reconciled", the second part of Behold a Pale Horse. The ending of "Truth and Reconciliation Suite" has been remade into "Movement". Under Cover of Night is redone in the end of To Kill a Demon, the intro of Follow Our Brothers, Halo Reborn, and the first part of Greatest Journey. Dust and Echoes, redone as Wake Me When You Need Me. Perilous Journey, redone in "Make Them Pay", the last part of Farthest Outpost. Shadows, redone in Gravemind and the last part of Halo Reborn (Guilt and Punishment). "Leonidas", from the Delta Halo Suite, redone as "Leonidas Returns" in Three Gates. The Delta Halo theme, remixed in "We're Done Here", the end of Brutes. Unforgotten redone as Never Forget. The beginning of High Charity Suite(Rue and Woe) redone as "Heroes Also Fall" in the second half of Black Tower. "Broken Gates" redone as Out of Shadow. Parts of it are also used in This is Our Land and Farthest Outpost. Unyielding/Reclaimer, redone in Three Gates and One Final Effort. In Amber Clad, semi-redone in Farthest Outpost. A portion of Roll Call is a remake of Under Cover of Night interpolated with the guitar riff of In Amber Clad. Ghosts of Reach, redone as "Black Tide" in Dread Intrusion. The High Charity theme, redone in Tribute. The tune of The Last Spartan is mixed with the Halo Theme in Finish The Fight, This is the Hour, and Keep What You Steal. To hear more about this album listen to the September 20th Bungie Podcast. When played in reverse, Black Tower on Disc 2 plays a cryptic message from the Gravemind, different than the one heard on the Halo 2: Original Soundtrack.. The quotes reflect several lines from T.S. Elliot's poem, The Hollow Men; which is the original source of Cortana's famous words; "This is the way the world ends."